Cheesy Instant Pot Mashed Potatoes - What's In The Pan? 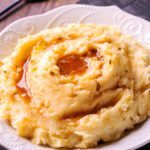 Instant Pot Mashed Potatoes! They are rich, creamy and absolutely the best! 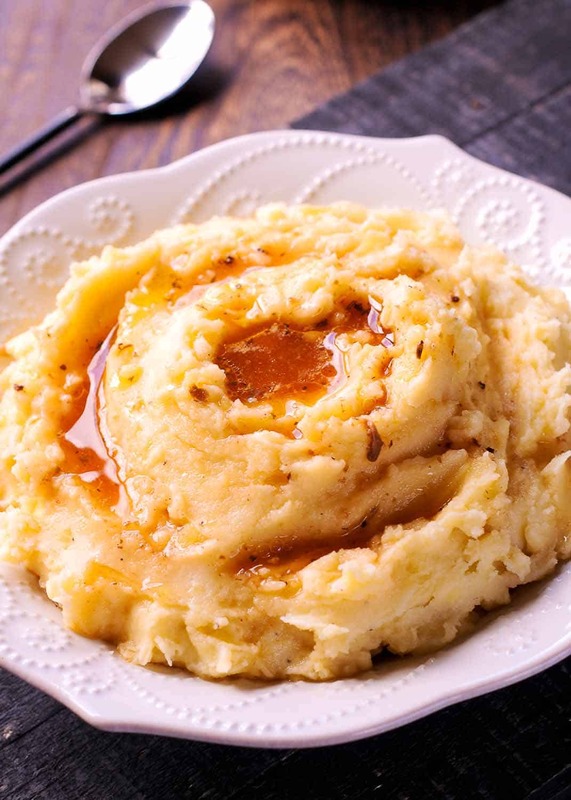 These pressure cooked mashed potatoes are mashed right in the Instant Pot. Then simply add cream cheese, butter, and garlic! Enjoy them as side dish with any meal, but especially with these Instant Pot Country Style Ribs. The Instant Pot is a dream come true for getting restaurant quality mashed potatoes on your table. Especially when needing easy side dishes during the holidays. You will get light, creamy and fluffy mashed potatoes every time! 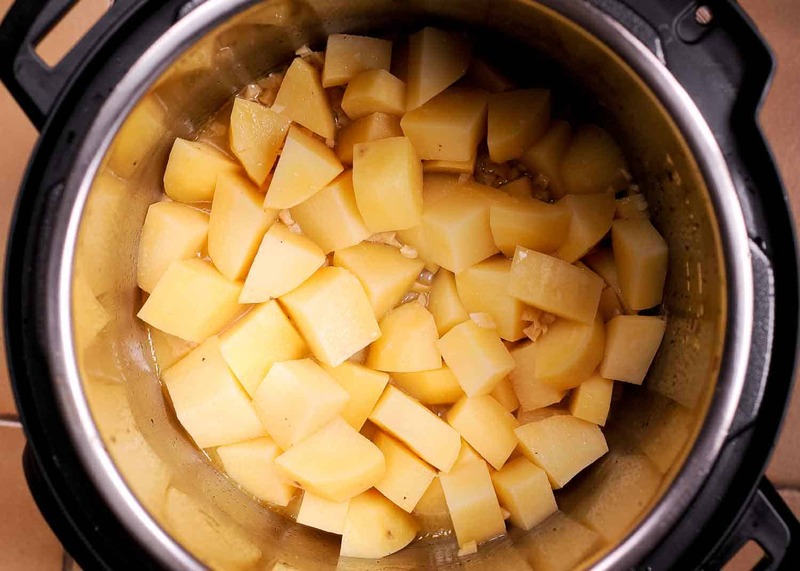 Once you set your Instant Pot to pressure cook the potatoes, you can focus on preparing other parts of your meal. Or taking care of your kids! 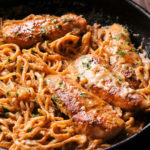 You will love serving these Instant Pot Mashed Potatoes with Instant Pot Chicken. 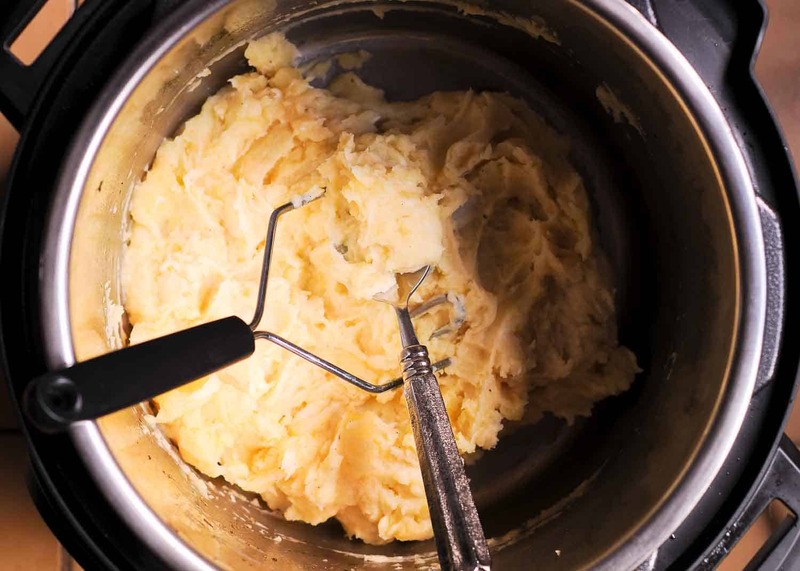 All you need to make creamy Mashed Potatoes is your pressure cooker and a good potato masher! I usually use classic stainless steel wire masher, or this fine grid potato masher. 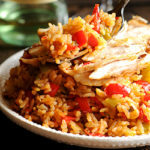 This incredibly tasty side dish is very easy to make. Because you don’t even have to drain your potatoes. The first step is to add chopped potatoes, garlic, chicken stock, salt, and butter to the Instant Pot. But the way, I like to use starchy potatoes, such as russet to produce the fluffy mashed potatoes. Then you will secure the lid and turn the valve to sealing. Cook them on manual high pressure for 8 minutes. Once time is up, you will release pressure immediately by turning the knob to ‘vent’. When all the steam is gone and the pressure is released, open the lid. The second step is to mash the potatoes right in the instant pot using a potato masher. Once the potatoes are mashed, add the remaining butter and cream cheese. Taste and add more salt if required. And just like that, the Instant Pot Mashed Potatoes are done! Have you ever had bad results from trying to make mashed potatoes? Red potatoes, for example, are great for baking, or roasting, but not so good for instant pot mashed potatoes. The best option for light, fluffy, and flavorful mashed potatoes are Russet or Yukon gold potatoes. Once you made the choice, everything else is easy and fast. As a matter of fact, it takes longer to peel and the potatoes than to pressure cook them! 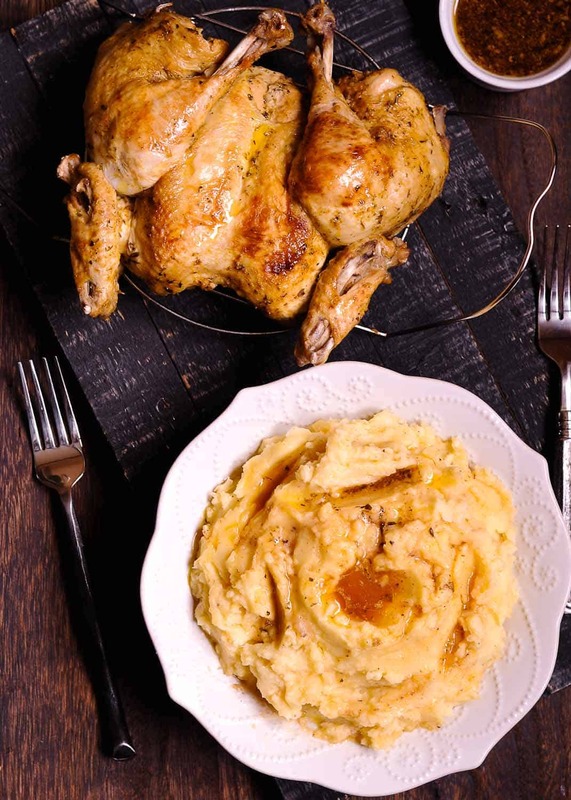 When we made these Instant Pot Mashed Potatoes, we served them with this Spatchcock Chicken with Mustard Crust. The star of the show was the most delicious chicken pan drippings on top of the comforting mashed potatoes. If you are pretty busy and running behind, these Instant Pot Mashed Potatoes will save you! Because when it comes to dinner, the best mashed potatoes come quick and easy! Prepared and mashed right in the Instant Pot, complemented with cream cheese, butter and garlic! Add potatoes, garlic, chicken stock, salt and 1/2 tablespoons butter to the Instant Pot. Secure the lid and turn the valve to sealing. Cook on manual high pressure for 8 minutes. Release pressure immediately by turning the knob to ‘vent’. Once all the steam is gone and the pressure is released, open the lid. Once the potatoes are mashed, add the remaining butter and cream cheese. Taste and add more salt if required. I love these potatoes! I thought I’d share that I’ve done them with unpeeled red potatoes (such a time saver) and they come out delish! That’s good to know about unpeeled potatoes! Thank you for sharing. Can these potatoes be made then set aside in a covered dish to keep warm while cooking the IP pork chimps in creamy wine sauce?? Since that recipe calls for a roux, I wouldn’t want to let that one sit for too long. Plan on making these potatoes and those chops for a quick dinner tomorrow night! I usually keep them warm in the oven. I reheat mashed potatoes that way too. We LOVE these potatoes! My only change was roasting the garlic before adding it to the IP. So yummy! I’m all in for garlic roasting in mashed potatoes!! I love these! I’ve made them so many times! If I want to double, should I double the cooking liquid? Thanks! Double up on everything, except liquid – increase it to 1 cup only. Yes, it’s enough – you only need to cover 1 inch of liquid. You can also place the potatoes on the trivet, but it’s not necessary. 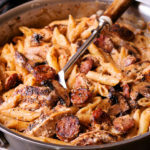 I didn’t used a trivet and used 8 quart as well in this recipe. 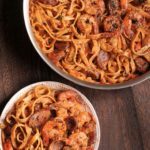 Made these – loved how easy they were and that I could mash them right in the IP!